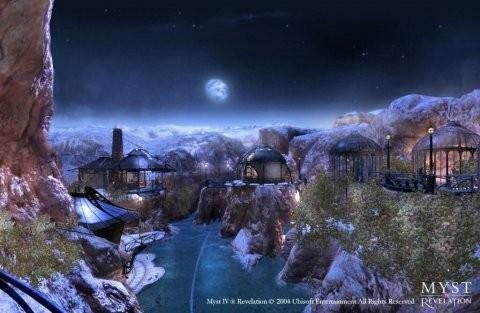 The Myst franchise changed hands once again after the release of Exile, as Ubisoft took over the reins for 2004's Myst IV: Revelation. Thankfully, the result was an exceptional game that combined all the elements that made its predecessors so great while adding a few dynamic qualities of its own. Not only does it tell a fantastic story, but in sending players to the worlds where Atrus’s sons are imprisoned (along with two others), the artists created what is arguably the best looking Myst game ever created. The new Ages are incredibly diverse, from the fog-enshrouded tower peaks of the dreary Spire to the prehistory-tinged land of Haven, and each is filled with little animations that bring them to vivid life. To capture it all, Myst IV shipped only on DVD, helping pioneer the shift to a new medium just like the original Myst did more than a decade earlier. Revelation isn’t all beauty without brains, of course. After the relative ease of Myst III, the puzzles here are extremely complex and challenging, yet always fair and nicely integrated. To help keep track of clues, for the first time in the series a camera was provided to photograph important details for later reference, and a personal journal allowed for in-game note taking. The interface was updated with additional interactivity as well, requiring you to physically pull levers or turn pages in a book. This was mainly a cosmetic addition, but it added to the overall sense of immersion. And by returning the storyline to its original roots, players were once again given a choice between the two brothers, offering another chance to determine their fates once and for all. Though the genre’s heyday was long gone by the time of its release, Myst IV proved that the franchise still had the power to deliver a compelling puzzle-adventure experience that few others have ever surpassed. 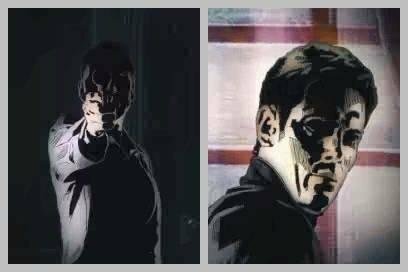 As the sequel to Hotel Dusk: Room 215, Cing’s Last Window: The Secret of Cape West had its work cut out for it, but it was clearly up to the challenge and then some. In the ongoing story of ex-cop Kyle Hyde, now door-to-door salesman and finder of things that don’t always want to be found, Kyle is without a job and soon to be without a home. But his life takes an even more unexpected turn when he is offered a chance to find out what happened to his father 25 years ago, right there in the same apartment building that’s about to be demolished. Before long, you’ve become fully immersed in yet another gritty interactive story, with its hand-drawn graphics and film noir-like atmosphere that make the game very hard to put down. Not when there’s so much to do, as exploring the Cape West apartment building involves visiting and interrogating fascinating characters and solving well-integrated, multi-solution puzzles, all while discovering plenty of dark secrets along the way. As with the first game, the Nintendo DS is held sideways like a book while playing, and the shoulder buttons, microphone, and folding platform itself are put to good use in situations where the player’s actions perfectly mimic in-game activity. The game also introduces several new improvements over its predecessor, and even includes a full novelized version of your exploits in detail at the end of each chapter. This is a great refresher if you’ve been away from the game (it’s so long you’ll have to put it down once in a while), though you’ll likely be eager to dive right back into the game, if only to access the impressive jazz soundtrack from the in-game jukebox. You need to love reading to enjoy games like this, but if you do, Last Window is a masterpiece of interactive fiction brilliantly blended with graphic novel sensibilities. It may have been the swan song for its talented Japanese developers, but they certainly went out on a high note. The words "effortlessly cool" are not normally attached to point-and-click games, but Full Throttle is precisely that. The epic opening sequence of a lone biker’s inner monologue as he drives along a highway sets a riveting stage for the high-octane adventure to come. Written and designed by Tim Schafer, the 1995 motorcycle-themed release offered lavish graphics, a brilliantly voice-acted cast of characters, and a rockin' soundtrack. If there’s one teensy little flaw, it’s that it’s short – really short. So short you’ll think you’ve done something wrong when the credits roll. It’s perhaps the only real reason (and maybe a few ill-conceived action sequences) it doesn’t occupy a more elevated position on our list. But being left wanting more isn’t just a testament to its abbreviated length, but also the quality of the adventure to that point. Full Throttle represented a big step forward both graphically and technically for LucasArts in 1995. The soundtrack featured biker band The Gone Jackals, the first time commercial music had been used in one of their games, while the SCUMM engine was overhauled entirely and the superb voice cast sported names like Tress MacNeille (The Simpsons) and Mark Hamill (Star Wars) on the roster. The cast is first-rate, with the late Roy Conrad's grizzled anti-hero Ben providing a completely new take on the point-and-click protagonist; a guy you can never quite understand and would certainly never want to meet in a dark alley. The art direction was unparalleled at the time, and its bleak, dystopian setting was brought vividly to life with some gorgeous backdrops and cutting edge animation thrown in to round it all off. 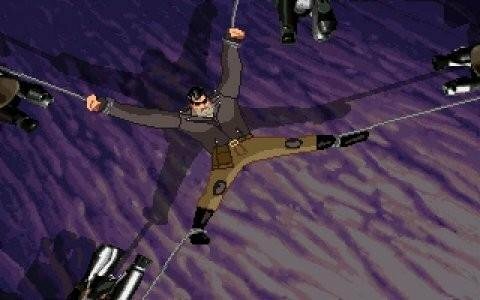 It may have ended too soon, but Full Throttle was one game that fired on all cylinders while it lasted. 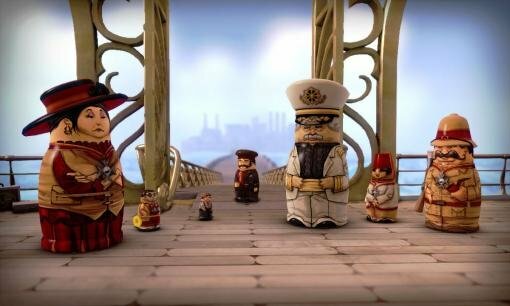 A game where every character is a Russian nesting doll can be easy to dismiss as child’s play, but Double Fine's 2011 downloadable Stacking has a charming appeal as broad as its humour. Set in 1930s America, the game stars Charlie Blackmore, the smallest matryoshka doll in the world whose family has been abducted by a cruel captain of industry and forced to work under horrible conditions to advance the tycoon’s vague-yet-diabolical plot. Overlooked because of his size, Charlie uses his diminutive stature to – in true stacking doll fashion – jump into a series of incrementally larger dolls in order to solve puzzles, free his family, and ultimately stem the tide of greed and corruption that threatens the working class. In another compelling touch, all the action is displayed in a stylish period vision, complete with cinematic silent film dioramas. What makes jumping into other dolls so much fun isn't just their often funny reactions to the sudden invasion, but the fact that each dolls boasts a special ability. Some, such as headbutting people or performing a pantomime, are simply for colour or to accomplish one of the game's many sub-goals, but many of them, such as attracting the attention of lusty men, are integral to solving puzzles. Deep down, Stacking uses the same tried-and-true “find the key to open the door” gameplay employed by countless other adventures, but here the “key” is another doll or sequence of dolls and the “door” ranges from a staggered piano concert to an absurd dog race, which is what makes the game so engaging and utterly unique. Simple in design, Stacking turns the basic elements of adventure gaming on their ear – not by obfuscating puzzles through layers of absurdity but by iterating on one simple change. This not only makes the game eminently entertaining but elevates it to a high shelf in gaming history. Sanitarium may start with a clichéd premise – horrible car accident, man wakes up unable to recall his own identity – but from the moment you discover the protagonist wrapped in heavy bandages in a decrepit mental hospital, every detail becomes suspect as you begin a surreal journey through the patient's psyche to discover the truth about his condition and his past. Throughout the game, the story alternates between the “real world” of the sanitarium and the twisted depths of the protagonist's mind, which manifest as a variety of disparate locales, from a mutant plant-infested farm to an Aztec civilization to a weird alien bug world. Not only does the landscape change, the character does as well in reaction to the “reality” he is currently facing. While you are Max Laughton in the hospital, once you enter his mind's eye, you will transform into characters such as a tribal god, a multi-armed Cyclops, and a little girl. While the transitions may seem nonsensical at first, they all come together in the end, and along the way you experience a truly affecting and horrific story of love and loss. Initially marred by some technical issues upon its release in 1998, including a game-stopping bug in the second area, Dreamforge’s magnum opus marched on and eventually received critical recognition for the creativity of its settings, the strength of its narrative and the quality of its puzzle design. Like a David Lynch movie, it’s impossible to tell fantasy from reality, though you’ll constantly try to piece together each tantalizingly cryptic piece of the memory puzzle as you encounter them. While not a “horror” game per se, the ever-changing but consistently creepy atmosphere is among the best the genre has had to offer before or since. Along with its rotating world mechanic and switching protagonists, it also has one of the most sincere and genuinely moving moments in gaming history. 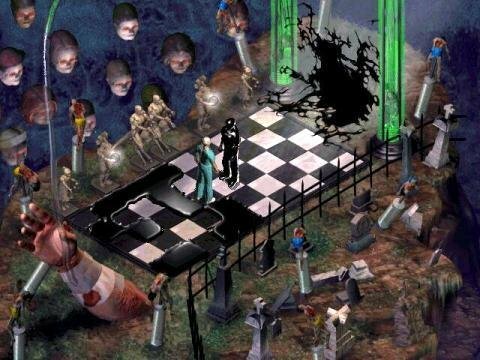 While the game failed to set the sales charts aflame, Sanitarium has rightly come to be considered a cult classic among adventure gamers, and is a worthy addition both to this list and any gamer's library.